This is wonderful! 450 sq ft would still be relatively easy to heat and the layout and storage options are wonderful! Did I mention it’s absolutely adorable? We use one propane wall heater and our budget is $40/month. We always have some budget left ant the end of the year. The electric varies but we average around $60-$75/month because in ohio we are lucky to get 2 decent “no heat/no air” months a year. We run a dehumidifier in the winter and a window air conditioner in the summer. Otherwise we would be closer to $35/$40 per month. First, I really like the layout. Surprisingly open for a little house. Second, thank you for having a little house that looks like a home instead of a fake-looking modern boring architectural magazine presentation. You know, with lots of neutrals, sleek-line everything, where everything had been placed used a measuring tape so it is PERFECTLY centered. So boring. Third, there’s some great decorating ideas even if not putting together a little house. This house has love and humor and functionality. First, and my only concern, is how the stairwell works. Steps are funky in the turn-around/curve of staircase. Can it be visually clarified what is happening in the layout of the steps. Second, I’m intrigued by what appears to be lots of doors on the outside, but are they all really functioning doors? It would be nice to see a floor plan just to clarify how all the parts work together (but I guess that goes with any presentation of a house interior). I would like to know where could I buy a house like this one! I am in Ohio but happy to talk with you wherever you are. Super funky, I love it! My husband and I are preparing to build our own, more like 300 sq ft and I’m drawing so much inspiration from your home. I am SICK of seeing modern tiny house after modern tiny house where it looks as though the owner has been a minimalist since birth. It’s nice to see a small house with a little “stuff” in it. There is no way I could live like that. One major obstacle for me to living in a smaller space is easily feeling like things are messy or cluttered. The decor and accessories in this home are too frenetic and numerous for my taste. Not a good advertisement for their homes. There’s a reason why real estate agents advise people selling their homes to paint whites and neutral colors, it looks like more space and the buyer can more readily see themselves (and their things) in the space. It seems obvious they designed and decorated to suit their tastes not the real estate market, If they ever want to move out, they can easily neutralize the color palette and contents. The neat thing about tiny houses is you can afford to customize so your house suits you. Create a whole different feel by enclosing your storage. Choose a few decorative pieces and swap them every so often and you’ll be less overwhelmed without having to actually get rid of collectibles. Carefully chosen and/or custom furniture in the right layout will also make a big difference to how calm or cluttered the space feels. It was a sad day when people started treating their dwellings as assets instead of homes. Bland, neutral marketing-approved furnishings belong in brochures for timeshares, not human habitations. This welcoming little house announces its personality at first sight, so a “staged” interior with black particleboard and taupe walls would be a cruel disappointment, like a Ken Burns film turning out to be a profile of Kim Kardashian. I wouldn’t worry too much about the owners’ ability to sell their home if they choose to. There are plenty of people who don’t want to live in a place that looks like a Hampton Court. I agree, this is a great use of space and resources, why, if it’s not your thing are you looking, let alone commenting, everything about this house is an inspiration, LOVE IT!!!! Thanks for your nice comments MP. You hit it on the head, or our head, LOL! Every house does not have to be according to your tastes. This home shows creativity, warmth, and love. There is room in this world for everyone to express themselves through their abodes. Maybe being able to appreciate differences might help you become less apt to criticize them. I wasn’t aware that the owners of this adorable cottage were trying to sell it, Art. Where here does it state that? And please let us know why we should care whether or not you yourself would want to live there? I think it’s fantastic. All of it. You rocked it right on the head FredInMaine. As many here have already said, our home is not for sale at the present. We were added onto the blog here without notification but that’s fine. If we were going to sell though, we would “de-personalize” it because we know our taste is not for everyone. We are both artists and thrive on color and stimulation. Without it, we find our senses bored. Much of this “collection” is passed down from family members so to us, it has more meaning than simply clutter, but I do get what you are saying. I absolutely love this!! Amazing job. Do you have a design or drawings available? Hi Diana and thank you for the kind words. In the photo of the bathroom there is a red and white container underneath the sink with the letters ‘if” on it. Can you tell me what company that logo is from and what sort of container it is? I’d like to see if I can find one on ebay. It was a metal bucket that laundry detergent came on from the “IF” company. I have seen them in better shape than ours on ebay. We got ours at a local farm auction. 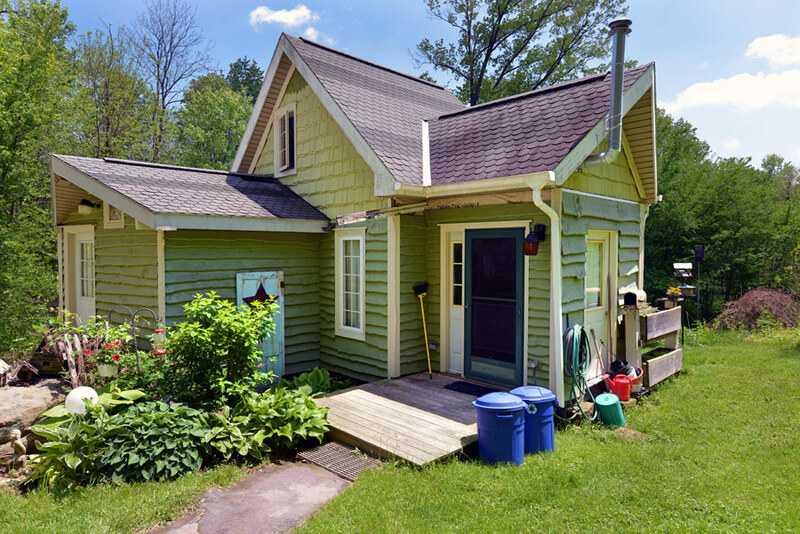 Are you willing to share the floor plan for this adorable cottage? 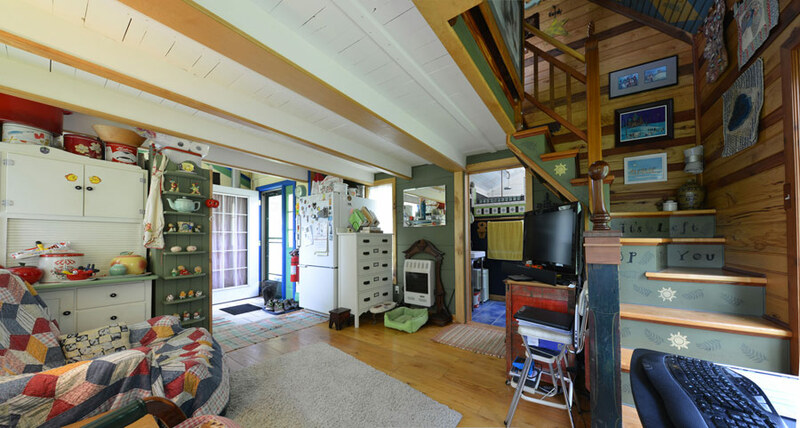 I have been looking at tiny homes on trailers but the narrowness is not as appealing at this small open plan… Great job! and can you estimate the cost of this home… DYI AND with help? Would love to chat about it! I’m very interested too in blue prints???? I love how its deco’ed! I don’t care for narrow/wheeled either. 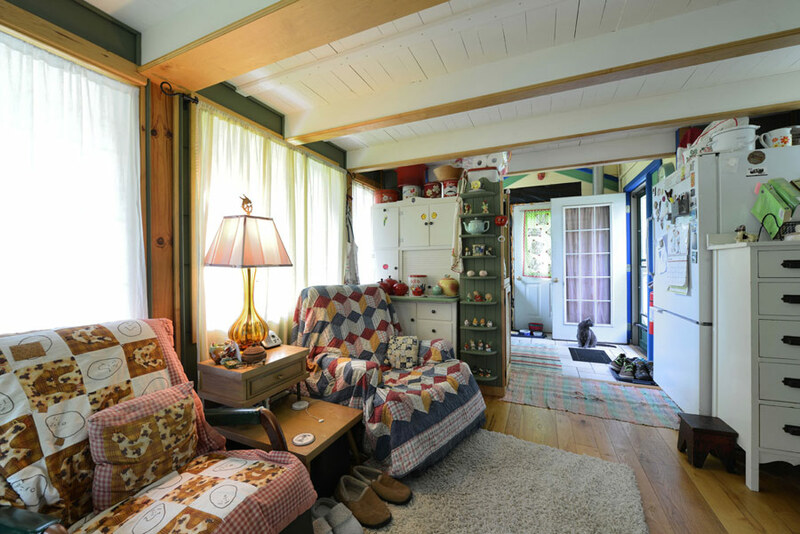 This homey, cottage-y feel is definitely suiting me just fine! I agree that the tiny homes on wheels are not all that permanent feeling. We don’t blog about them and only discuss homes under 1000 SF that are on some kind of permanent foundation. I love this little mansion!!! I especially love the quilt of The Incredible Mr. Limpet in the bathroom!! My wife Sue handmade that. It’s even double sided with different pictures! I’m with Rebecca, most small houses are taken to extreme. This place is small while still being livable. I’d love to see more places like this. As an aspiring tiny house builder, i’d love to hear more about how your house was made and hear any advice you would have for someone interested in doing exactly what you did. Would you be willing to chat about your experience and plans with how this house was built? It’s built & designed around the materials I gathered first. Much more economical that way. Far cheaper than desiging a home with 3′ x 4′ windows and then finding out they are 4 times your budget. I have a post and video at shinytinymansion.com about gathering before you build. Contact me directly through the blog if you want to chat. Always happy to “small talk” , LOL! If you took out 75% of the stuff in this house, and less color it would be perfect for me. I would love this. This is the best tiny house I’ve ever seen! And I’ve looked at a ton of them. I love how they’ve managed to integrate their love of collecting vintage memorabilia into the tiny space. If I ever build my dream tiny house, I want it to be much like this one. I need more kitchen space. 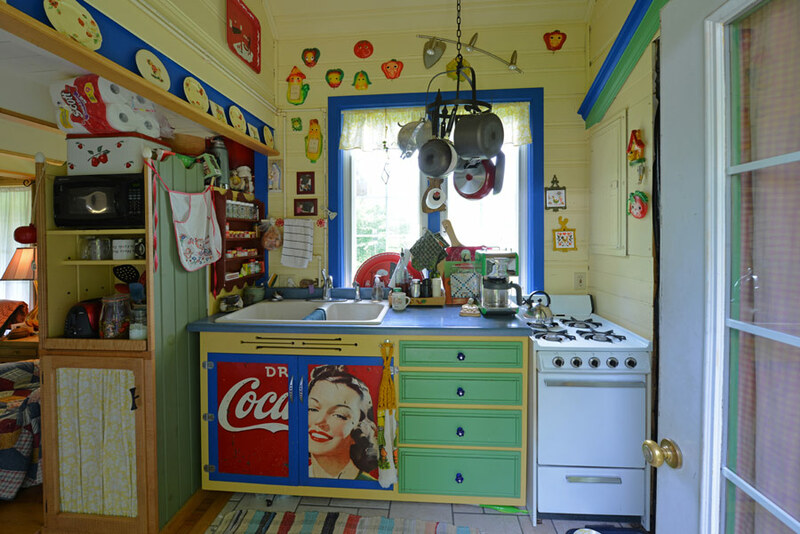 I love the idea of the small houses and I’d actually love to build and live in one but I’d need to have a larger kitchen. And kids…with two kids it would be pretty difficult to be that cramped. I agree, with 2 kids it would be more than cramped. It will be interesting to see all the folks living in the movement tiny trailers do with kids as they grow. We don’t feel “micro” is sustainable for most folks. Has to do with where you live too. If it’s a warm climate, being outside all the time helps. That’s not the case here in Ohio. Although it would be difficult to cook a Thanksgiving dinner here and serve everything warm, it’s amazing what Sue can cook on a 2′ counter top! Like everything else, you work around what you have and devise new ways. That said, I am a firm believer that you can still live small but design into your needs. If you are a gourmet cook, it may be more important to have a larger kitchen and a smaller living space. We are both artists and have about a 140SF studio building not attached to our house. Electric and a small plug in heater but no water in it but it serves its’ purpose. I like the floor plan, but the decorating style ( cottage?) is too “busy”, and too “ecclectic” for me. After seeing so many tiny houses that are so barren looking (modern styling I guess) I am glad to see a house that looks like a HOME! 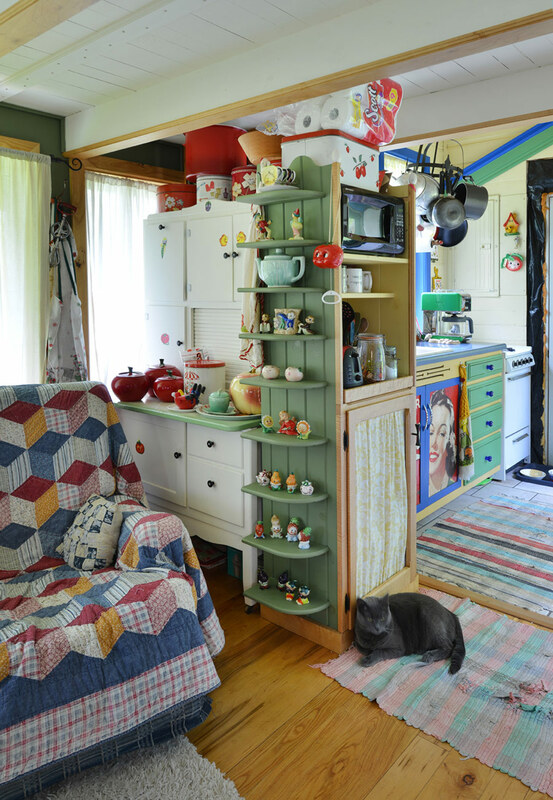 I love the eclectic style of this cottage! It makes the space feel more open. Great layout! I love the whole tiny house concept but am restricted by local codes. I also am not interested in the 100 sq ft house with 2 children and a wife. This is a great start while i build other structures around something to tie in later to meet local codes. Great layout. Very Mary Engelbreit. Made me smile! Happy tiny house people live here for sure….kudos! How nice! and thank you for the kind words. Love the collection of Mary planters in bedroom. I collect them too!! great house. Ohh, you noticed those 🙂 Those are Sue’s. She’s always loved Mary as an iconic figure to woman more than a religious piece and has a few collected and displays them all together. Nice and calming visage. Really enjoy the glimpse into their cozy place. As I probably will not ever live in a tiny house full time we will more than likely continue to live in a much smaller than average home. This has some fun and good ideas, along with ideas that I can make my own. Thanks for the kind words. I agree. Unlike many of the younger folks, proselytizing about the joys of living in a 200SF camper (which we did for 6 years! ), living really small is not for everyone and it will hardly change the world. We blog about living in 1000SF or less which is still really small by USA standards. We each decide for ourselves what works for us and how much we want to spend to own rooms we never use. No one is right or wrong in the size of their house and making it a home is what’s important. I absolutely love this. I could move right in and be very happy! You did a great job creating this space for yourselves. It reminds me of the little house in “Up”…. All that’s missing are the balloons out the chimney! I admire your energy and I love the bright decor! It does seem a lot larger than 450 sq ft and you seem to have all the necessities. My husband and I have lived in a 400 sq ft cabin for one year, six months, and 22 days. It’s like living in a motel room. We are in the process of building, but it can’t be soon enough for me. Although, I must say, small living can make you realize all the things you can do without. All my nice things are stored in the attic of the barn, but so far I’ve done without them and survived quite nicely. I love the fact that your home is welcoming, cheerful and reflection of your life. Well done! Your cottage is so eclectic and homey. It has YOUR signature all over it – which is what makes it uniquely your own. Lovely! I live in OHIO too.. and would love to live in this house!! Now, where exactly do they let you have this home? As they years grow closer to retirement, I certainly would love a Tiny house. Like others, I would love to see the floor plan. I like how open it looks because of the taller ceilings. Great job! We live in central Ohio, way out in Amish country. We have no local codes here so it is much easier to build something unique. If you would like to visit sometime in warmer weather, email me directly here or through the blog. I absolutely LOVE this house–every inch of it! If you ever decide to sell it, please contact me as I want to be first in line to buy. Barring a sale, it would be awesome if you could make the floor plans available. This just POPS with color, joie de vivre and personality! Ahhh, thank you for the kind words. I collected all the materials to build first at auctions and discount houses and then designed around them ~ and the big boulder by the bathroom! We talk about selling and moving to a warmer place all the time but never do. We may look at renting it out for a month at a time so folks can get a feel for the reality of living small in a cool place 😉 Contact me if you would like to stop by sometime. I love this house; it makes me happy! It does not even look like a tiny house. It appears to have more room than my 843 sq ft. Thanks. Smiling is the nicest compliment anyone can pay. Thank you so much. You made my day! The pics may be a little deceiving, but everyone who has stopped by and seen the cottage first hand says it doesn’t feel claustrophobic. That’s good and what I designed for 😉 Open as possible and lots of sun. When I say I want to live in a tiny or small house, THIS is what I’m talking about!!! This place is insanely cute and has so much personality shining through. Great job!! Wow, I love it and all the bright different colors. It is a cozy looking place and I would love to live there. We may rent put by the month down the road so stay in touch. Would give folks a great feel for what living tiny with some ZAZZ is like, LOL! I love your bathroom, the colors are courgeous. I would love to live is your home. I am an empty nester and ready to downsize. I have fallen in love with tiny houses. After being a flight attendant for 12 years, I miss living in a hotel room. Your home is beautiful. Thanks for sharing. If you have an open house, I would love to visit. If you do rent out in the future, would love the idea. Have even thought about doing something like this along the Ohio. Thanks so much! We may have an open house this summer. Join us over at our blog or facebook and stay in touch. Thanks for posting. This is a cool house. Great floor plan, thoughtful, and practical. The bathroom tile is gorgeous! Everything, from the colour, to the creativity used I designing the spaces, the chaos and clutter of a house that caters to the needs of everyday living, even the cat lounging there – this was absolutely captivating. Thank you so much! We may have an open house this summer but if you are ever coning through central Ohio, stop by! Email me at ron@shinytinymansion.com and we can set something up. We will need a couple days lead time so we can spruce the place up a little, LOL! This is the first tiny home I’ve seen that contained belongings and had personality. I love it! My goal is to have my own tiny home within e years. I’ll be using this post to convince my husband that belongings do fit. Thank you for sharing. Sorry for the late response but it’s SO hard to keep up over all the “internets”, LOL! Thank you so much for the kind words. We really wanted to show true tiny living without staged photos in a sterile environment. We also want a bedroom to stand up in and real stairs instead of a ladder. We still love our house 🙂 If we can help in any way with advice on living small, let me know. I’m in love with this adorable little house!! Both the space as well as all the colours the interiour has!! Love the stairs! The kitchen is just the right size and immediately connected to the parlor outside which is ideal for the summer and BBQ’s with friends! Yup, I’m in love!! Great little house!! We don’t eat meat but grilled veg rocks on the back porch!!! This is just gorgeous. When I first did a ‘walk through’ i thought “I bet one of you is an artist”. Then I read your comments and you both are. I love what you have done and kudos for doing it mostly yourselves with a little bit of help from your friends when needed. I hope you have many happy days/months/years here. Nerida ~ thank you so much for the kind words! Our taste is certainly not for everyone and they let us know, but it’s lovely to hear from another person who gets us. Bland and boring environments scare us to death, LOL! That said, we have parred down even more but I miss many of our bric-bracs. Now we rotate fewer out though so it makes them even more special. Just the cutest I’ve ever seen! Wow!